You are probably wondering what the hell happened this week. Friday’s relatively minor retreat in global stock markets – apparently due to increasing concerns about inflation and rising interest rates – suddenly became violent. I’m in New York working with colleague Kevin Rose. At lunch time on Monday the Dow Jones index was down about 1%. Two hours later, he looked at me, eyebrows raised, and said “the Dow is off 1,500”. The 7% intra-day fall ended up becoming a 5% fall by the close of trade and the turmoil then spread around the world. Absent any significant economic news, central bank announcements or a declaration of war, we were left scratching our heads. Volatility trading – a formerly obscure corner of financial markets – has been identified as the culprit. You may not know much about vol trading. But you won’t be surprised to hear that, should you choose to pursue it, there is no way you are ever going to lose money. The strategies have all been back-tested. That’s the way the marketing spiels run. In reality, these strategies pay investors regular small amounts of return for taking on risks thought implausible. Until one of those unprecedented 10-sigma events that couldn’t possibly happen comes along. Credit Suisse sponsors a short volatility exchange-traded note (of course!) with the Nasdaq ticker XIV. It profits from benign markets and has returned 150% per annum for the past two years, with the down days few and far between. The volatility strategy might be new, but the concept is anything but. Long Term Capital Management was exploiting small bond yield differentials, with huge amounts of leverage, on the assumption that the gap had historically always closed. It worked for years, then the Russian government defaulted on its debt and LTCM went bust. Through the mid-2000s, many supposedly risk-free money market funds started juicing their returns by investing in residential mortgage-backed securities. They had never lost money, and there would, of course, always be liquidity. Until there wasn’t. The collapse of Bear Stearns began the whole financial crisis. An unnamed source in Roger Lowenstein’s When Genius Failed – The Rise and Fall of Long-Term Capital Management likened these strategies to “picking up nickels in front of a steamroller”. They often work for long periods of time. And the longer they work, the safer they seem and the more money floods into them. And then the steamroller obliterates everyone. On Tuesday the net asset value of the XIV note fell by 76%, taking it all the way back to the starting point. 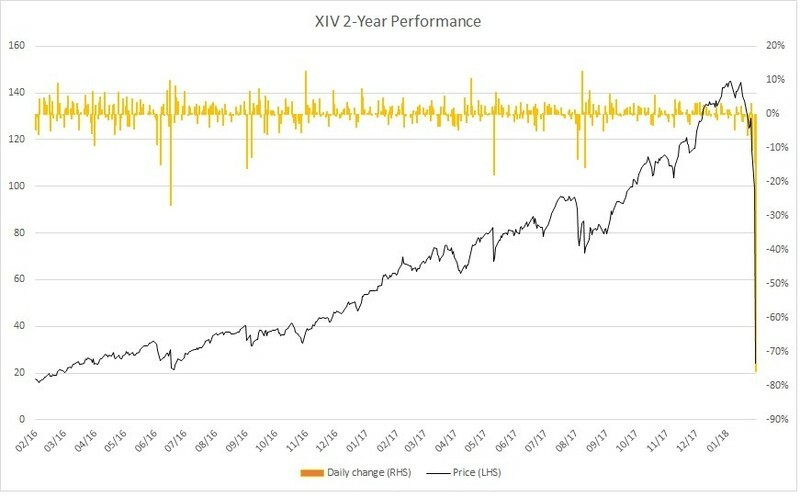 The unravelling of XIV and many similar products and strategies apparently accelerated yesterday’s downturn. The maths wizards behind it will have learned a lesson, but rest assured there is another generation waiting in the wings. This episode will likely be short-lived and contained. But it is a perfect example of the stupid things low interest rates have induced people to do in order to earn an extra percent of return. A larger steamroller could flatten many more penny gatherers.